The first line of defense for maintaining a healthy human body is the immune system, whose necessary responses of single cell and intercellular interactions function through versatile mechanisms. However, effector natural killer (NK) cells in the immune system could be in direct contact with target cells and cause their death. Immune cells execute their physical activities through versatile mechanisms where cell–cell interaction is one of the important mechanisms. Furthermore, through observing the immune cytotoxic activity of individual NK cell during the interaction with the target cell, the overall performance of immune system could be predicted. Manipulating a single cell in a suitable environment can provide an immediate and direct observation of its cellular behavior. Recently, using microfluidic techniques to manipulate and observe single cells has been widely applied to clinical research, such as drug and toxicity screening,6 tissue engineering, and cancer immunotherapy. NK cells are effector cells accounting for approximately 5–15% of peripheral blood lymphocytes and they play important roles in the innate immune system inside the human body. A cancer immunotherapy μ-environment LabChip, equipped with titanium oxide phthalocyanine (TiOPc)-based optoelectronic tweezers (OET) to achieve direct cell–cell contact, is developed to study the interaction between immune cells and other cells for real-time analysis of NK cells' behavior. 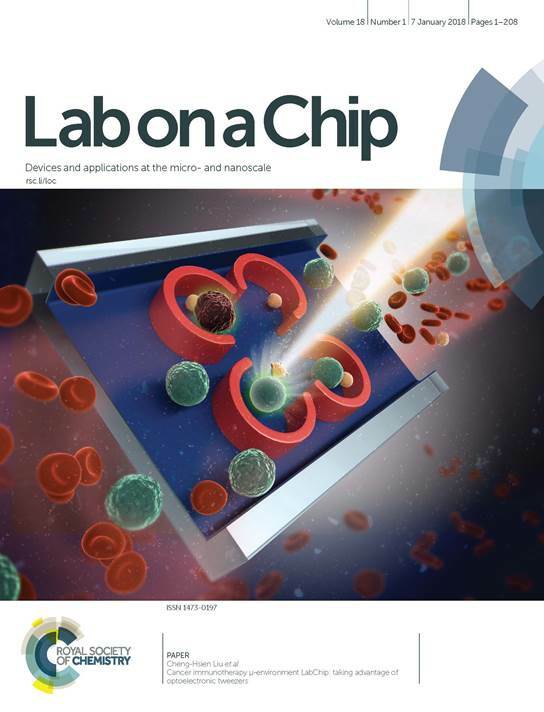 The illustration for cancer immunotherapy μ-environment LabChip, taking advantage of optoelectronic tweezers, developed in our group is shown in the following, which is a cover image from our published paper accepted by Lab on Chip.